Here is one of my favorite pasta salad recipes. I think it began as my attempt to recreate a dish I had enjoyed somewhere, but for the life of me I can't remember where. Anywhay, I've been making this one for years, and leftovers never last more than a day in my house. Cook pasta in salted, boiling water until al dente. Drain artichokes and set aside. Drain sun-dried tomatoes and slice into slivers. Pit olives and cut in half. Combine olive oil, balsamic vinegar and sugar to make dressing. Drain cooked pasta. 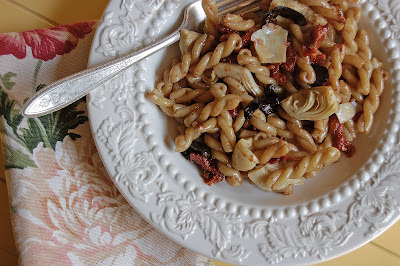 Combine in bowl with artichokes, sun-dried tomatoes and oil-cured olives. Pour dressing over all and add salt and pepper to taste. I realize that oil-cured black olives are probably an acquired taste. I have to admit that I am the only one in my family who eats them -- the rest of my family picks them out. But I think they make the dish. Anyway, try it, I think you'll like it! Today is the first day of our semi-annual Visiting Nurse's Rummage Sale -- a gigantic sale filled with great things. I'm practically salivating at the thought of it. My friend, Robin, and I plan to go this morning at opening time. Wish us luck! Another Note: Kacey, at Wine on the Keyboard, is running her Photo of the Month contest for April. If you get a chance, go on over and see all the great entries -- they are beautiful! Good morning, Mary. Your salad sound delicious. I make a similar one, but I have never added the olives. I put a some shaved parmigiano reggiano on mime. I will have to try the olives and the sugar. I'm sure that puts a completely different spin on the salad. Thanks for sharing. Good luck at the sale. I hope you share pictures of your finds. You must be so excited to go to the sale. Don't you just love those annual events...something about the anticipation. My big annual event is the Providence Preservation Home Tour, June 7th this year. I can't wait for that or to see your goodies from today. A friend gave me that recipe several years ago, but hers adds seeded tomatoes (I substituted grape tomatoes) and shredded chicken. The chicken soaks up all that balsamic dressing and is fantastic. Hope you get great stuff at your sale! I really love your blog...and I TOO love pasta! Thanks for the recipe! I do hope you'll be sharing your fabulous bargains/finds with us! Good luck! That looks so yummy. I love pasta salad too. That salad recipe looks delicious and I will have to try it. Have fun today at the Rummage Sale. Pick up a few more flower prints for framing. I wish the one beautiful May weekend, and a good sales of this exhibition. Good luck shopping and the pasta recipe looks lucious...I am thinking Memorial day! Any thing with olives has to be good! Your pasta salad looks yummy! Someone should write an ode to pasta! I could give up meat but leave me my pasta any day! Good luck on the sale. Can't wait to see your treasures. Donna, Kalamata olives would be great in this, too! This looks like a great recipe and I will be giving it a try for sure - I LOVE oil cured olives! The photos are wonderful this month on the photo of the month contest, aren't they? They take my breath away. Hey, and weirdly enough, I'm craving pasta. Must go see if I have the ingredients for this. Gonna try this one!! I could eat pasta everyday!! Oh how good does that look!? I will have to try this...love ALL the ingredients!